Indeed, well ahead of the curve. 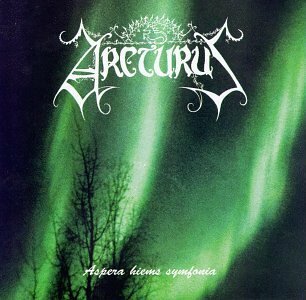 Arcturus's debut album proceeds along the positive path one might have felt it came from after the My Angel EP. Of particular note here is the marked difference this band has from fellow black metal bands at the time or before it, none of which were creating music with this type of atmosphere, which was less dreary than many others such as Emperor, Bathory, etc. Also, the mixture of traditional black metal vocals and traditional singing help to highlight the differences between a standard black metal band and one such as this, which as has already been mentioned, can be deemed Progressive Black Metal. Besides the fact that many of the musicians here are considered in the top of their field, the compositions themselves are quite good. Personal favorites of mine like Raudt Og Svart remind me somewhat of Genesis's Can-Utility, acting as a mini-epic in the span of only 5 to 6 minutes. As you might have guessed by the song titles, some songs are sung in English while others are in Norwegian. This does not detract from the music, as the way it is implemented does not lose the flow of the album. While this is not the best Arcturus release, I consider it the best place to start. The band is not as avant-leaning as they are in later albums and there is enough traditional song structure here for the common prog fan. An outstanding band and an album worth having.